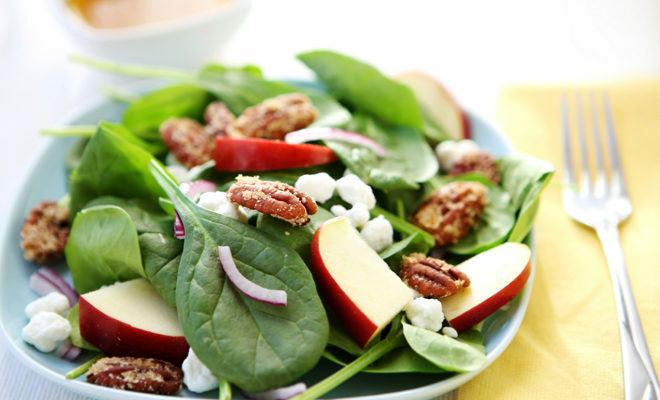 Pecan Apple Spinach Salad... We're Obsessed! Salads don’t have to be boring! By incorporating tasty ingredients, such as fruit for a hint of sweetness or just the right kind of cheese for some added flavour, you can transform a cup of plain-jane lettuce into a delicious meal. This Pecan Apple Spinach Salad is easy to make and is truly one of my favourites! 1. In a large bowl, mix the spinach, chicken, apple, onion, cheese, and pecans. Toss lightly to combine. 2. In a small bowl, whisk the vinegar, olive oil, stevia, salt, and pepper. 3. Pour the vinaigrette over the salad and toss to coat. Serve immediately. ← Previous Story Mrs. Cannon’s Cooking Corner: Donuts In A Dash!